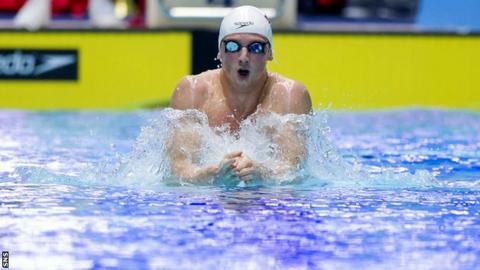 Michael Jamieson broke the qualification standard time for Team Scotland comfortably at the Scottish National Open Championships in Glasgow. The 25-year-old, who is bidding to take part in the Commonwealth Games in the city later this year, posted a time of 2:08.01 in the 200m breaststroke. Ross Murdoch, who was second, also produced a qualifying time. Kathryn Johnstone won the women's 100m breaststroke final, with Corrie Scott coming in second. Reflecting on his win, Olympic silver medallist Jamieson told BBC Scotland: "It's job done. That's me on the team, thankfully. "Being an ambassador for the Games it would have been a hell of a story if I hadn't made the team, so it's good to get that out the way. "It wasn't a great swim tonight. I think the heat this morning was a much better swim technically than tonight. "I struggled to settle down this afternoon, just the excitement of being back racing again, and I probably went a bit too hard this morning and that has taken the shine off my legs tonight. "I'm a little bit annoyed because I'm definitely in better shape than that but it's my first race in a little while so hopefully I can build into the competition and again next week at the British Gas championships as well." Johnstone said Corrie had pushed her "all the way" and added: "I can see her out the corner of my eye. Of course, I'm always pleased to touch the wall first but I'm so happy she's made the [qualifying] time too." Glasgow local Robbie Renwick won the 400m freestyle at the Tollcross event, again with the qualification standard. He said: "After the disappointment yesterday in my 100m, I really learned some lessons from that race and today I was a lot more relaxed going into it. The race felt so much better. "As you can see in my face, it's such a relief to get that qualifying time and be selected for your country this summer. "It's going to be a really strong Scottish team this summer. "The 200m is coming up on Sunday so I'm looking forward to that. In the 100m yesterday I was really tense in the whole race and I didn't do me much good. "Come this summer this place is going to be an absolute riot so it's fantastic getting in this facility." Other swimmers to achieve consideration times were Dan Wallace, Stephen Milne (both 400m freestyle) Calum Tait (200m breaststroke), Sian Harkin (50 freestyle), Hannah Miley (800m freestyle and 200m IM), Katie Armitage (100m breaststroke), and Aisha Thornton and Camilla Hattersley (both 800m freestyle).